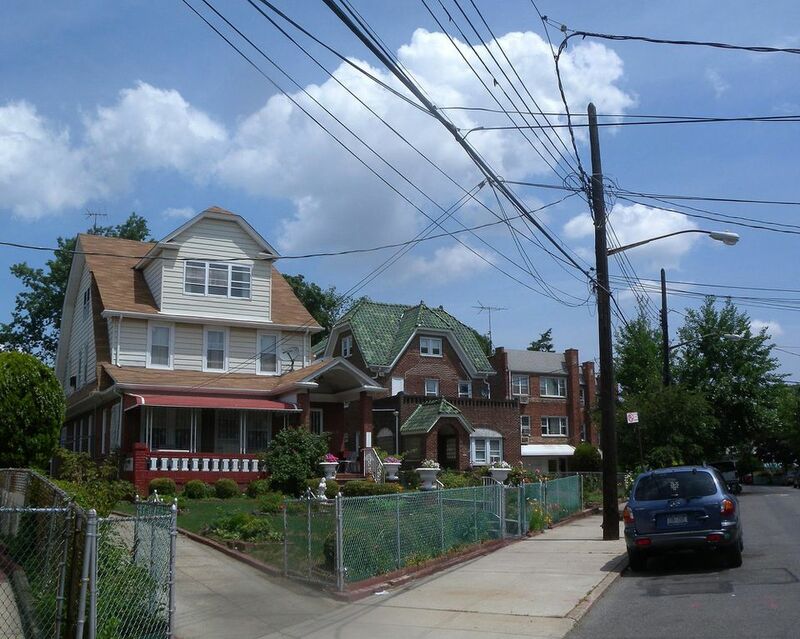 Briarwood, NY, is known by some as the "hidden gem" of Queens because it has retained a low profile, despite its many positive features. Smack dab in central Queens, Briarwood is convenient to highways, the subway, LIRR, and buses. Families abound. They come for the tree-lined, quiet streets and schools. The neighborhood attracts successful immigrant families, but no one group predominates. Housing is a mix of single- and multi-family houses and apartment buildings. To the south is Hillside Avenue (Jamaica), and to the north is the Grand Central Parkway (Kew Gardens Hills). Briarwood meets Jamaica Hills to the east at 164th Street, and Kew Gardens to the west at Queens Boulevard/Van Wyck. The Post Office considers Briarwood's zip code (11435) part of Jamaica, but the neighborhood is distinct from downtown Jamaica, which is south of Hillside Avenue. Check Briarwood's location on a map. The two main drags are Parsons Boulevard, just south of the Grand Central, and Queens Boulevard between Main Street and Hillside Avenue. Both have take-out restaurants, laundromats, 99 cent stores, and markets (there are more on Queens Boulevard). There is a Key Food on Queens Boulevard, which has a small parking lot in the back, and online grocer Fresh Direct delivers to the neighborhood. Briarwood's proximity to many transportation options is one of its strongest points. The express F subway stops at Hillside and Parsons, again at Hillside and Sutphin, and at the Van Wyck/Briarwood station at Queens Boulevard and Main Street (25 minutes to Lexington Avenue in Manhattan). The E train stops at the Van Wyck station late at night and on weekends. The LIRR stations in downtown Jamaica and Kew Gardens are also fairly convenient (20-minute walk). Briarwood is right off the Grand Central Parkway, the Van Wyck Expressway, and the Jackie Robinson Expressway (Interboro), and just down Main Street from the Long Island Expressway (L.I.E.). When the Van Wyck is clear, it takes less than ten minutes to drive to JFK Airport. Briarwood boasts a small library that perches over the Van Wyck at Queens Boulevard and Main Street. In addition to its main collection of English books, the library stocks books in Russian, Chinese, Spanish, and other languages. Hospitals abound in central Queens, though none are in Briarwood proper. Close by are New York Hospital Queens (56-45 Main St at Booth Memorial Ave) and Queens Hospital Center (82-70 164th St, just north of the Grand Central). Briarwood is in NYC School District 28. The Joyce Keld Briarwood School ( PS 117) teaches kindergarten through 6th grade and is at 85-15 143 Street. Around the corner is Robert Van Wyck Middle School ( JHS 217) at 85-05 144 Street. The small and well-rated Queens Gateway to Health Sciences Secondary School (JHS/HS 680) is at 150-91 87 Road. Archbishop Molloy High School, a private Catholic high school, is on Main Street near Queens Boulevard and receives high praise for its academics. Briarwood is in the 107th Precinct (718-969-5100), which includes Fresh Meadows, Jamaica Estates, Jamaica Hills, and Kew Gardens Hills. As of November 16, the precinct reports four murders in 2003, versus one in 2002, and 13 rapes reported, compared to 12 last year. Burglaries are down slightly from 620 in 2002 to 590 in 2003. There is a police station in the Van Wyck/Briarwood subway station. Prices have skyrocketed since 2002. One-family homes (often attached) are snapped up quickly. Prices start over $250,000 (for a fixer-upper) and go much higher. Multi-family homes begin over $400,000. One-bedroom condominiums (most on Main Street or Queens Boulevard) sell for $90,000 and up. Rents are cheaper here than in nearby Kew Gardens. One bedrooms start at $1,000 and three bedrooms at $1,400. Briarwood lacks a wide profile, which makes online home-hunting difficult. The local dining scene is strictly take-out food and casual eateries. Alba Ristorante and Pizzeria (137-65 Queens Blvd, at Main St, 718-291-1620) is very good, and always full of police and students from nearby Archbishop Molloy. Down the street is Spiro's Coffee Shop (138-49 Queens Blvd), a great little neighborhood diner. The bigger Flagship Diner across Queens Boulevard is also a good bet. As is the petite and sweet Avenita on Parsons Blvd at Coolidge Ave. Newcomer Chicken Hawk (138-59 Queens Blvd between 86th Rd and 86th Ave, 718-206-1118) serves yummy South American-style chicken and sides. Go ahead and get the "whole chicken" with your rice and beans. And don't leave without the gooey, sweet yellow plantains. Pani Dolce (718-526-4407) on Queens Boulevard at Main Street is the best bakery for Italian-style loaves, cookies, and pastries. Grab one of the little tables at the window so you can watch the sidewalk action while sipping your cappuccino. Want a good bagel? Walk past the Dunkin Donuts on Queens Boulevard, and two doors down you'll find the popular neighborhood joint Bagelot (138-07 Queens Blvd). This family-owned place makes very tasty bagels, and you couldn't ask for a greater staff. The International Foods Deli (Parsons Blvd at 84th Dr) stocks Greek foodstuffs like first-rate feta and kalamata olives. Best of all is its bread selection. Tear into a loaf of hearty Greek bread, perfect for dipping in olive oil and salt. The bar scene in the neighborhood is pretty much dives. Grey's at the corner of 84th Road and 164th Street caters to St. John's students. Many prefer to go to neighboring Forest Hills, in the Austin Street area, for a drink.